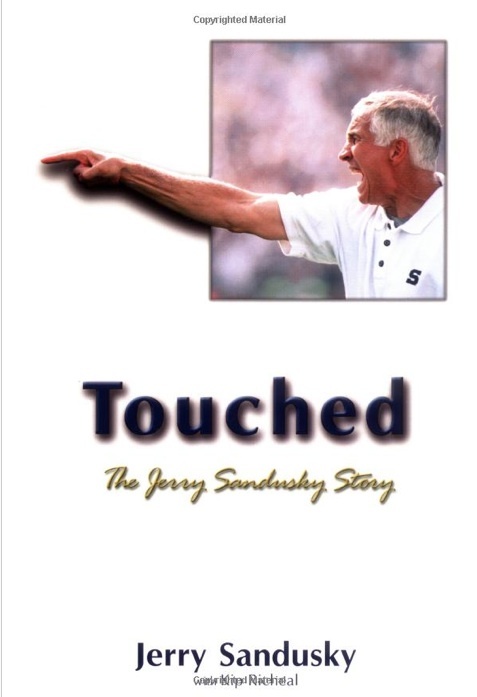 Like a real book entitled Touched: The Jerry Sandusky Story. This has to be a hoax, right? Right? If not, then You. Must. Be. Ef—–. Kidding. 100% false advertising by Mr. Sandusky. Not a single page in this book “touches” on how to appropriately gain the trust of young, at-risk boys, and then use that trust to perpetrate horrifying sexual assaults on the very children who turned to you for guidance and support. Almost as disappointing as the first time I watched “Touched by an Angel.” Don’t even get me started on that bullcrap. I still can’t watch anything with Della Reese in it. More seriously, I started reading the grand jury report on Sandusky, but had to stop by the fourth page it was so sickening. If half of what’s in the grand jury report is true, I hope Sandusky is treated to the very worst of what American prisons have to offer. A close friend of mine with long experience investigating and litigating the child abuse scandals in the Catholic Church and the Boy Scouts wrote me to say he expects the whole story is much worse than we yet know. Right now there are nine identified victims. Rule of thumb: with serious serial predators like this, the actual number is usually ten times higher. Yes, sometimes these things have turned out to be hoaxes (like the notorious McMartin case in California in the 1980s). But this time there are adult witnesses, so I doubt it. I’m with Ondrasik on this (in the SI piece in our Picks section earlier): Penn State’s football program ought to get the NCAA “death penalty” for this.